This temperature records showing the last 1,000 years deleted from the EPA report discussed below. Since taking office, the Bush administration has consistently sought to undermine the public’s understanding of the view held by the vast majority of climate scientists that human-caused emissions of carbon dioxide and other heat-trapping gases are making a discernible contribution to global warming. In May 2002, President Bush expressed disdain for a State Department report5 to the United Nations that pointed to a clear human role in the accumulation of heat-trapping gases and detailed the likely negative consequences of climate change; the president called it “a report put out by the bureaucracy.”6 In September 2002, the administration removed a section on climate change from the Environmental Protection Agency’s (EPA) annual air pollution report,7 even though the climate issue had been discussed in the report for the preceding five years. Through such consistent tactics, the Bush administration has not only distorted scientific and technical analysis on global climate change and suppressed the dissemination of research results, but has avoided fashioning any policies that would significantly reduce the threat implied by those findings. 2 National Academy of Sciences, Commission on Geosciences, Environment and Resources, Climate Change Science: An Analysis of Some Key Questions, 2001. 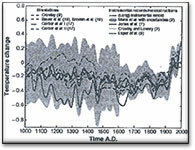 4 P. Dobriansky, “Only New Technology Can Halt Climate Change,” Financial Times, December 1, 2003. 5 US Climate Action Report, Department of State, May 2002. 6 K.Q. Seelye, “President Distances Himself from Global Warming Report,” New York Times, June 5, 2002. 8 “Report on the Environment,” U.S. Environmental Protection Agency, June 23, 2003. 9 A.C. Revkin and K.Q. Seelye, “Report by EPA Leaves Out Data on Climate Change,” New York Times, June 19, 2003. 11 Ibid. Deleted reference: National Academy of Sciences, Commission on Geosciences, Environment and Resources, Climate Change Science: An Analysis of Some Key Questions, 2001. 16 Revkin and Seelye, New York Times. 17 Author interviews with current EPA staff members. Names withheld on request. See also “option paper” in EPA internal memo, Appendix A. 18 Author interview with EPA staff member, name withheld on request, January 2004. EPA internal memo. 19 Russell E. Train, “When Politics Trumps Science” (letter to the editor), New York Times, June 21, 2003. 20 Russell E. Train, “The Environmental Protection Agency just isn’t like it was in the good old (Nixon) days,” www.gristmagazine.com, September 22, 2003. 21 White House, President’s Statement on Climate Change (July 13, 2001). 22 Author interview with EPA scientist, name withheld on request, January 2004. 23 As quoted in N. Thompson, “Science friction: The growingand dangerousdivide between scientists and the GOP,” Washington Monthly, July/August 2003. 24 Author interview with USDA official, name withheld on request, January 2004. 25 Author interview with William Hohenstein, USDA, January 2004. 27 Author interview with William Hohenstein, USDA, January 2004. 28 Author interview with USDA offi cial, name withheld on request, January 2004.